Corneal sequestrum is a disease affecting the cornea (the clear curved transparent part of the front the eye). The sequestrum is usually an area of degenerated or non-living corneal tissue. This develops after an area of chronic corneal irritation or non-healing ulceration. The area of corneal degeneration often turns light brown to dark brown or black in color. The sequestrum may affect only the outer layers of the corneal stroma (tissue), but in some cases the sequestrum extends deeper into the cornea and may lead to deep ulceration, pain and possibly, corneal rupture. While corneal sequestra have been documented in horses, the disease is most common in cats. Corneal sequestra occur in cats of all breeds, however, the Persian, Himalayan, and Burmese are particularly susceptible. If your cat develops a corneal sequestrum, you might notice increased tearing, discharge from the eye and squinting. 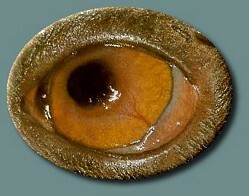 You might also see the brown (or black) area on the cornea. A corneal sequestrum can lead to corneal ulcers (superﬁcial to deep), ocular infections, corneal scarring, corneal vascularization and corneal mineralization. Corneal sequestra can occur as the result of chronic eye irritation. A large prominent globe, low tear production, decreased blink response and decreased sensation of the cornea, as seen in brachycephalic (or short-nosed, ï¬‚at-faced) breeds might create a predisposition to a corneal sequestrum. Another possible cause of this disease is Feline Herpesvirus. Sequestra can recur in the same eye or in the other eye in predisposed patients. Treatment for a corneal sequestrum usually involves a surgical procedure called a keratectomy. This involves surgical removal of the diseased layers of cornea. Our veterinary ophthalmologists perform this surgery using an operating microscope and specialized microsurgical instruments. Surgery relieves the discomfort associated with the corneal sequestrum, prevents the lesion from deepening and greatly shortens the healing time of the ulcer. If the sequestrum affects the deeper layers of the cornea we may elect to apply a tissue graft or similar material to strengthen the cornea in that areaand hasten healing. This may involve use of a graft consisting of the patients own conjunctiva (the pink, mobile layer covering the white of the eye), adjacent cornea, donor cornea, synthetic biological or collagen discs placed over the surgical defect. Some of these complications, if severe could lead to blindness; however most can be managed with prompt treatment.